"Tom was a key reason for the successful launch of Viadux's products into the Motorola worldwide channel organization. He provided marketing support and strategic guidance in all markets and personally drove the Latin American market initiatives. Tom was great to work with, a true team player, with great intellect and integrity." "Tom has always demonstrated a unique understanding of the European market. He develops marketing strategies that result in successful European channel establishment. On top of that, he is just a great human being who is a pleasure to work with." 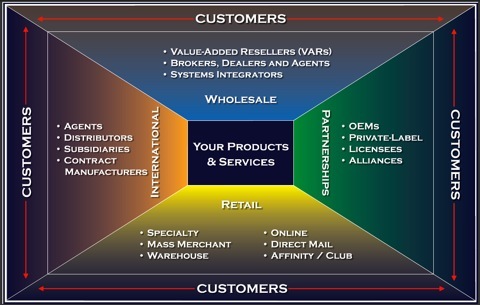 Structuring multi-tier channel partnerships, licensing, OEM, and supplier contracts. Performing distributed searches to link companies with trusted channel partners. As a company matures, it continually re-plots its course, to meet growth and re-organization opportunities. Hanson Marketing recognizes that channel partnerships should update with you similarly. As manager of international sales and marketing for a developer of CAD-CAM software for electronic design engineers, Hanson Marketing developed and led a network of international value-added resellers (VARs). Intellectual technology transfers were negotiated through licensing and localization agreements with master distributors in Asia and Europe. The results? Revenue from this VAR channel netted 40% of the company's annual revenue, and the company became of three top providers worldwide. Owing in part to its reputable reseller network and positive market image, the company was successfully sold.